In its vanadate (V5+) or vanadyl (V4+) forms, vanadium has been demonstrated to possess antidiabetic activity. Oral treatment of streptozotocin (STZ)-diabetic animals with either form is associated with correction of hyperglycemia, and prevention of diabetes-induced complications, although weight gain is unaffected. Vanadium treatment of non-diabetic animals lowers plasma insulin levels by reducing insulin demand, as these animals remain normoglycemic. 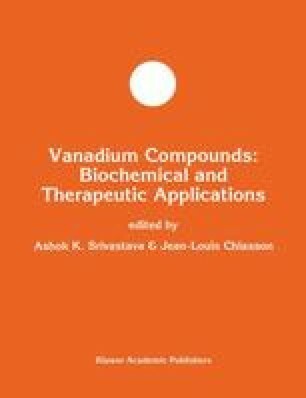 These results suggest that vanadium has in vivo insulin-mimetic or insulin-enhancing effects, in agreement with several in vitro observations. Chronic treatment with vanadium has also been shown to result in sustained antidiabetic effects in STZ-diabetic animals long after treatment has ceased. Thus, at 13 weeks after withdrawal from treatment, corrected animals had normalized glucose and weight gain, and improved basal insulin levels. In addition, near-normal glucose tolerance was found despite an insignificant insulin response. Since vanadium accumulates in several tissue sites (e.g. bone, kidney) when pharmacological doses are administered, it is possible that stored vanadium may be important in maintaining near-normal glucose tolerance at least in the short-term following withdrawal from treatment. Recently, following withdrawal of vanadyl treatment up to 30 weeks, diabetic animals which had remained normoglycemic and had normalized glucose tolerance showed improvements in plasma insulin levels both in the basal state and in response to oral glucose, as compared to those which had reverted to hyperglycemia. The observed significant improvements in insulin capacity over the long-term (>3 months) suggests that a restored and/or preserved insulin secretion may be essential for maintained reversal of the diabetic state over a prolonged period after treatment is withdrawn.